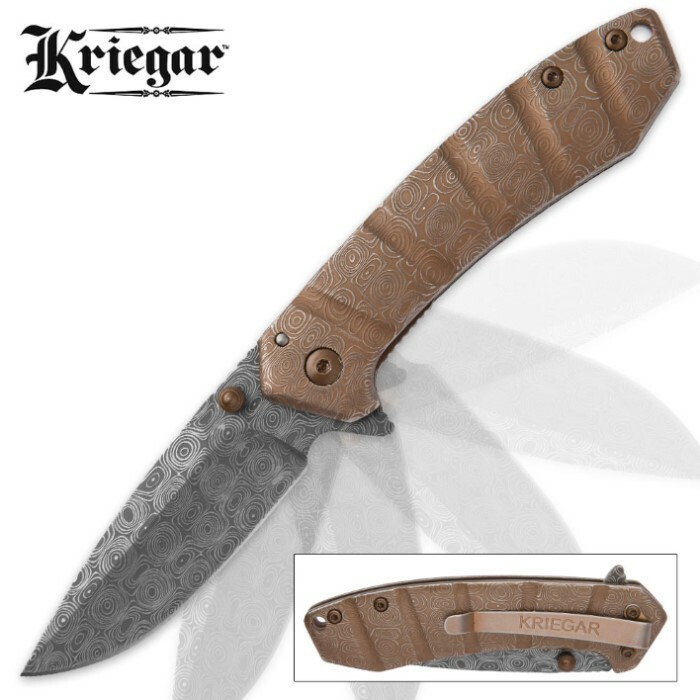 Kriegar Maelstrom DamascTec Steel Pocket Knife | Raindrop Etch Pattern | Copper-Colored Finish | BUDK.com - Knives & Swords At The Lowest Prices! Like ripples on still water during a rainstorm, the Kriegar "Maelstrom" Pocket Knife is a unique beauty that weds dazzling circular patterns and brilliant color with clean, sleek form. 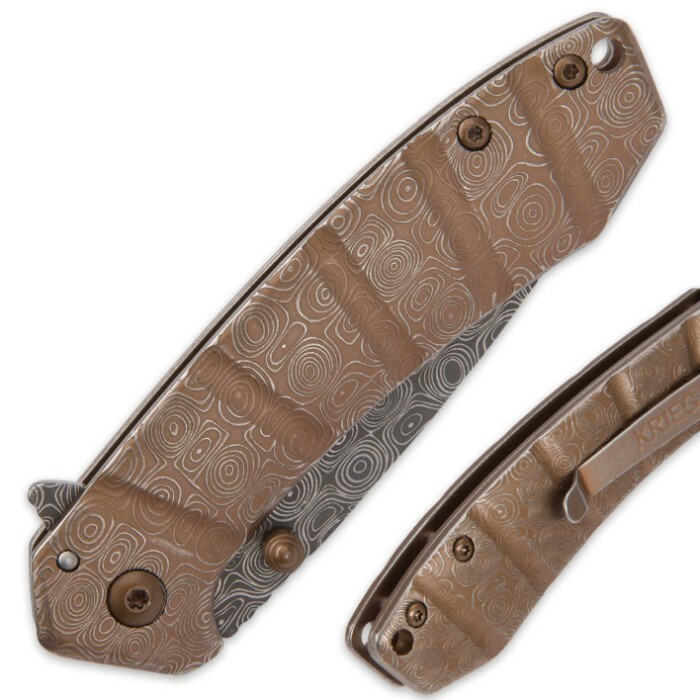 Its classic 3" drop point blade is forged from elegant DamascTec steel, which features a mesmerizing, practically hypnotic "raindrop" etch pattern. A whirlwind of swirls and concentric rings, the exclusive DamascTec steel offers premium durability and unequaled allure at an incredible value. The blade is honed to razor sharp, and ambidextrous thumb studs and a convenient flipper allow for easy, one-handed opening. The Maelstrom's sturdy liner lock keeps the blade fixed firmly in place for added safety and stability while open. Copper hued DamascTec steel handles exquisitely offset the traditional gray blade. At a comfortable 4" closed, the Maelstrom is easy to carry, especially with the built-in pocket clip and lanyard hole. Its striking beauty and distinctive charm makes it equally well suited to display. Regardless of how you use it, however, rest assured the Kriegar Maelstrom Pocket Knife will stand the test of time. Good size and weight. Assisted opening works fine. Unique design. Nice addition to my collection.